Texas 2 Step is a well maintained 2001 Cruisers Yachts 4450 Express Motoryacht offering a 3-stateroom layout including a beautiful full-beam master stateroom aft with ensuite head with a full size jacuzzi tub with shower. Additional features include a bow thrusters, full Isinglass enclosed sundeck and helm and molded-in steps from the swim platform up to the sundeck and then up on to the helm. Texas 2 Step is a very popular cruising yacht for couples or families due to the easy access to all areas of the boat. This vessel is powered by twin Volvo TAMD-74EDC 480 hp main diesel engines with ZF transmissions and an Onan 11.5 kw generator provides power for the yachts systems. This yacht is a Great Loop veteran and ready to cruise again immediately. Texas 2 Step will be sold turn key with all bedding, towels, kitchen items, tools, spare parts, fuel and oil filters, ropes, fenders, life jackets, ditch bag w/EPIRB, various cleaning solutions and supplies, fire extinguishers, spare stern anchor, snorkel diving gear, all Coast Guard safety items including flares, etc. 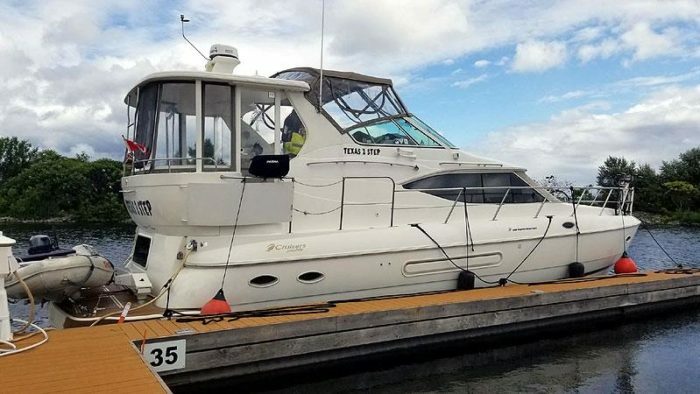 Contact Michael K. Martin via Email or 440-781-8201 or for more information and an appointment to view this 45′ Cruisers Yachts motoryacht for sale.